Thrissur Pooram Festival - This most spectacular Pooram Festival is held in the Malayalam month of Medam (April- May) in Thrissur, attracting large number of people. The main features of this festival are two lines of 13 richly caparisoned elephants facing each other in Vadakkumnatha temple grounds, a competition of swift and rhythmic changing of brightly colored and sequinned parasols called as "Kudamattam", traditional orchestra called "Pandimelam" and spectacular fireworks. 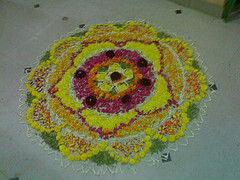 Onam Festival of Kerala - It is the harvest festival of Kerala which is celebrated with great enthusiasm by all the people irrespective of the religions. Nehru Trophy Boat Race - Started in 1952 following the visit of the late Prime Minister of India, Pt. JawaharlalNehru, this grand festival is held in August every year. Nehru Trophy Boat Race held at the Punnamada Lake is the most famous and popular Boat Race. The snake boats of Kerala are unique in their shape and with more than 100 rowers in each boat, attracts tourists from all over the world. Nehru Trophy Boat Race has the honor of being the largest team sport in the world. This world famous Boat Race is a not-to-be missed spectacle in Alleppey. 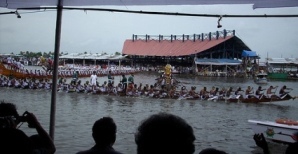 Aranmula Boat Race - Another popular Boat Race is held in August-September during Onam festival, near Pampa Lake in Aranmula near a temple dedicated to Lord Krishna and Arjuna. About 30 snake boats participate in this race. The main features of this Boat Race are the golden lace at the head of the boat, the flag and the ornamental umbrella, and the oarsmen with white Mundu and turbans, singing traditional boat songs, exhibiting true meaning of friendly rivalry. Arattu Festival - This famous festival is celebrated in Trivandrum in the famous Padmanabhan Temple, as the closingday of 10-day festival. It is celebrated twice a year - once in October-November and the second time in March-April. After performing the rituals by the ex-Maharaja, the idol of the Lord taken out on procession on the beautifully ornamented elephants, to the Shanmugham Beach for a ceremonial dip in the sea and slowly returns to the temple, marking the end of the festival. Attukal Pongala Festival - This is one of the world famous festivals Kerala India . It is a festival for the women. Now Attukal Pongala has entered into the Guinness Book of Records for the largest number of women gather in the world. For more information click here. Christmas is widely celebrated in Kerala.